Recorded in the spellings of Hend, Hender, Hinder, Inder and Indor, Hendrie and Hendry, this is an Anglo-Scottish surname. However recorded it is a form of the Anglo-French personal name Henry or Henri. 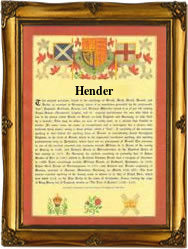 The surname as Hender, it is said, was originally popular in the English county of Cornwall, whilst as Hendry and Hendrie it was popular in the coastal Scottish counties of Ayr in the West and Fife in the East, although quite why this should be so, is not proven. The spelling up to the mid 16th century whether as first name or a surname was always found as Henry or Henrie, and as shown below, in this (near) form was one of the earliest of all Scottish surnames. The first recordings with what has to be described as the dialectal 'd', presumeably introduced as an aid to pronunciation, was not until 1562 when one Hendyre Hendry appears in the rolls of the ancient burgh of Stirling as a burgess of the city, and in London, Diggory Hender was a christening witness at St Margarets Westminster, on December 1st 1595, whilst Mary Hendry, the daughter of John Hendry, who was christened at the famous church of St Martins in the Field, also Westminster, on January 26th 1726. The name derives from the pre 9th century 'Haim-ric', which translates as 'home-rule', an apt description for the many 'Henry's' who have held the English throne. Throughout the centuries, surnames in every country have continued to "develop" often leading to astonishing variants of the original spelling.